*Race fee includes park entry, race photos, finisher bottle, lunch, + beer! Every Doubel Marathon Solo racer MUST start with a light, as you will run in the dark for the forst two hours of the race. Every Marathon and Double Marathon racer (solo and team of two) MUST start with a water carrier. You must either have at least one water bottle or a hydration vest/hydration pack. The start/finish will be at Russell Park (north side of Lake Georgetown). There will be aid stations on the east and west sides of the lake, along with a full aid station at the start/finish. In the 12 miles between the east and west aid stations, there will be a water drop. You will never go more than 8 miles without water. The aid stations will be between 6 and 8 miles apart, so carrying a water bottle or hydration vest is mandatory. DOUBLE MARATHON : You will start at 5:30 am and run the Goodwater loop twice, beginning clockwise, and finishing with a counter-clockwise loop. You must get to the aid station east (for the second time), which is approx mile 44, by 4:30 pm to continue. That will give you two hours to finish the last 8 miles of the course. 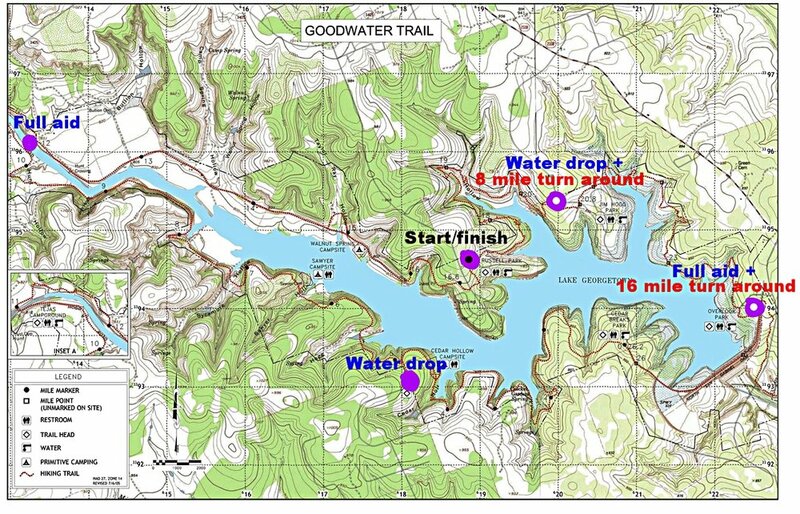 MARATHON : You will start at 7:30 am and will run the Goodwater loop once, clock-wise. You'll hit Aid Station EAST at mile 8, water/Tailwind at mile 14.5, and Aid Station WEST at mile 20.7. 16 MILER: You will take off east. At mile 4, you will hit a water stop, and continue heading towards the Overlook Trailhead/Headquarters, which you will hit at mile 8. There, you will see our full aid station. Then retrace your steps back to the start/finish, hitting the water stop again at mile 12. 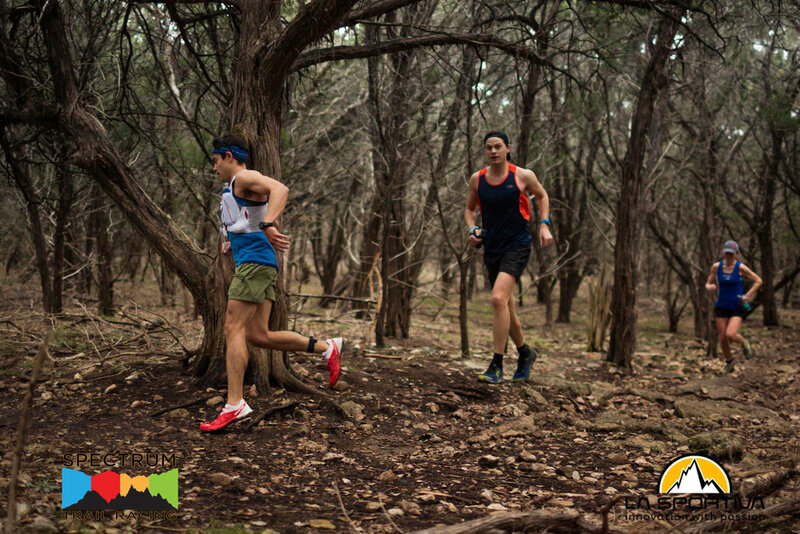 8 MILER: You will take off east and head towards the Jim Hogg Trailhead, where you will see a water drop at mile 4. Grab a water and turn around to retrace your steps to back to the start/finish. We love dogs, cats, parakeets, and your pet goldfish just as much as you, but they won't be allowed to join you at this race. You are welcome to leave your pup on a leash with a person at the start/finish, though! Pacers are only allowed on the second half of the double marathon. A pacer is only there for motivational support and safety, and thus cannot be used as a mule to carry any of your food/water/gear. You get your race swag (Goodwater bottle) for finishing, and only after finishing your race. You've got to earn it! We can't give refunds or transfers. Once you purchase your race entry, we pay the land owners for your park pass, buy swag, pay the insurance company, pay the timing company and photographer, and on. That said, we're still very reasonable people and want to help you out, if you write a compelling request.